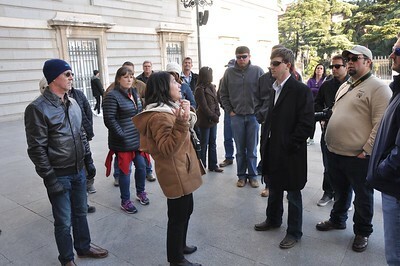 LSU AgLeadership Class XV travels to Spain and Portugal, to learn more about their agriculture. Photos by Jim Monroe and Neil Melancon. 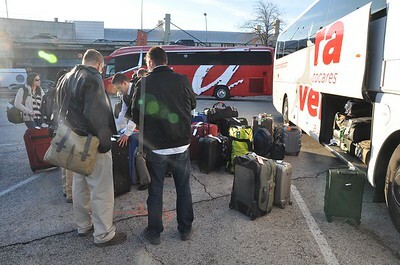 LSU Ag Leadership Class XV loads luggage onto the bus at the airport. 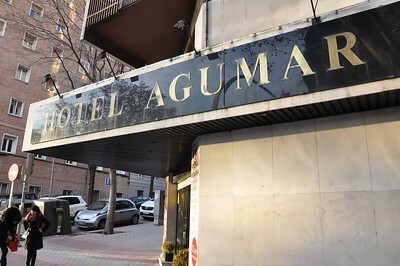 The next stop is Hotel Agumar. Estadio Santiago Bernabéu, the stadium where world famous football (soccer) team Real Madrid plays its games. 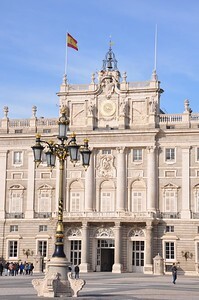 The Madrid City Hall. This is the newer city hall, replacing the one found closer to Plaza Mayor. 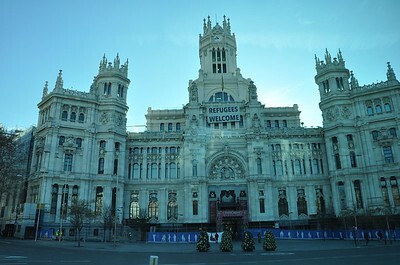 The sign which reads “Refugees Welcome” is in response to the Syrian civil war and the large number of people fleeing the country for their own safety. 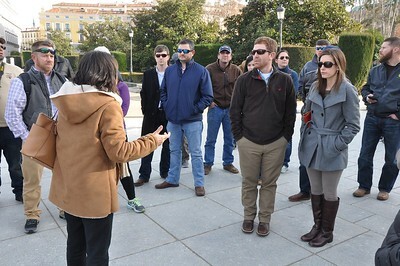 Madrid tour guide Isabella shares the history of the Royal Palace with LSU Ag Leadership Class XV members. Jason Burke, Stephen Simoneaux, Lance Gaudet, Aaron Lee, Brian Barham and his wife, Laura, listen closely. 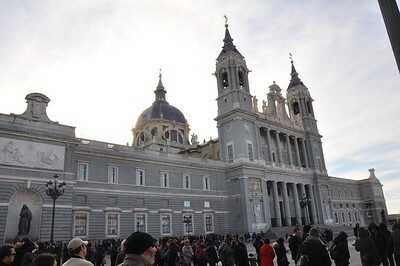 The Cathedral de Almudena is Madrid’s newest cathedral. Started in 1883, construction finished in 1993. 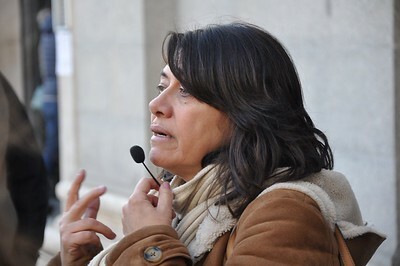 Isabella says there was no work done on the cathedral during World War I and World War II. This is the back side of the Royal Palace as seen through the bars of the wrought iron fence. Isabella tells Class XV about the consecration of the Cathedral de Almudena conducted by Pope John Paul II. 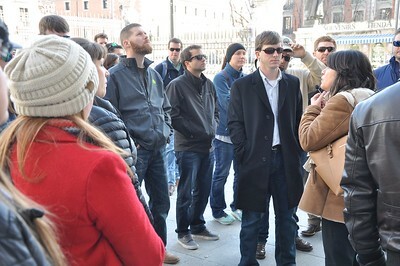 Karl McDonald looks up at the Cathedral de Almudena while Isabella tells Ben Sanders and the group about its history. 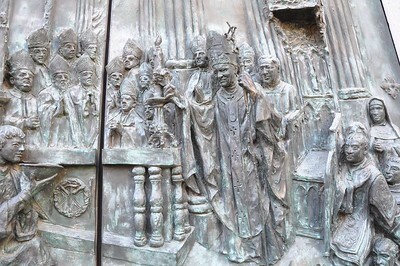 This is one of the bronze doors on the Cathedral de Almudena which depicts Pope John Paul II consecrating the cathedral. 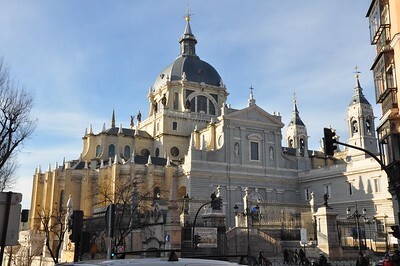 This is the only cathedral in Madrid consecrated by a pope. 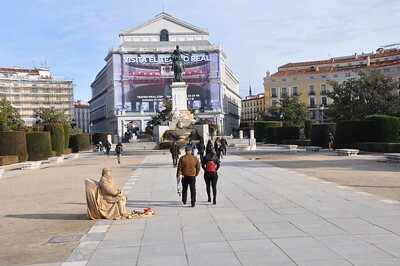 Dr. Richard Cooper and Stephen Simoneaux listen to Isabella in front of the Cathedral de Almudena. 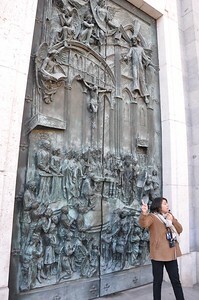 Isabella points out each of the people depicted in the door of the Cathedral de Almudena. This gives you a good idea of the size of this door. 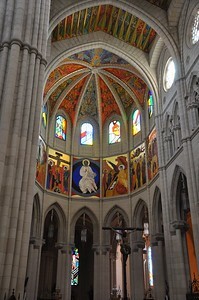 The colorful ceiling and stained glass windows inside the Cathedral de Almudena above the crucifix. 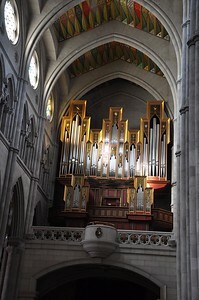 This is the organ inside the Cathedral de Almudena. The larger pipes play the bass notes while the smaller pipes play the high notes. 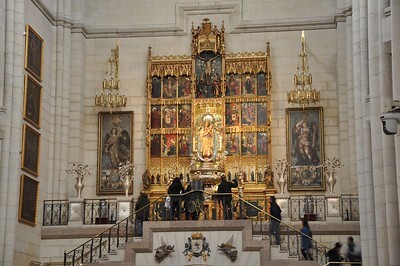 The side alter and baptismal font inside the Cathedral de Almudena. 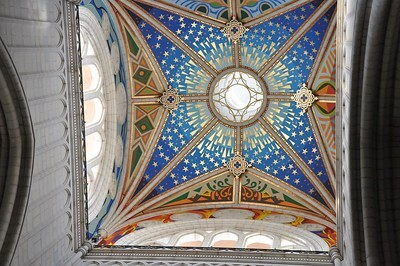 The decorated ceiling above the alter in the Cathedral de Almudena. 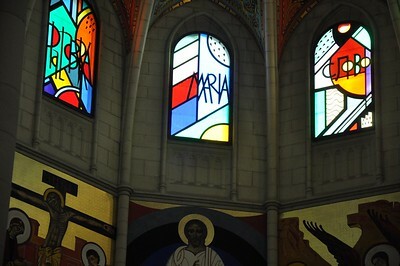 This close up of the stained glass inside the Cathedral de Almudena shows the modern, angular style used in most of the windows. This is the rear view of the Cathedral de Almudena. 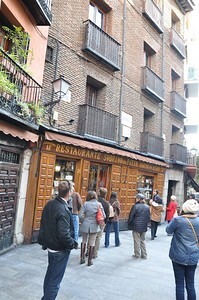 On Calle Codo, Class XV finds Restaurante Sobrino de Botin, certified as by the Guiness Book of World Records as the oldest restaurant in the world. 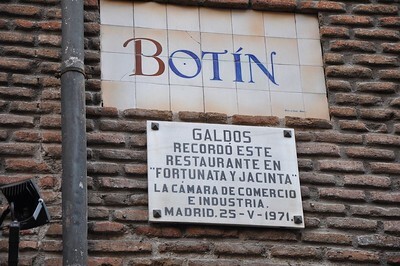 The sign which designates Restaurante Sobrino de Botin as the oldest restaurant in the world. 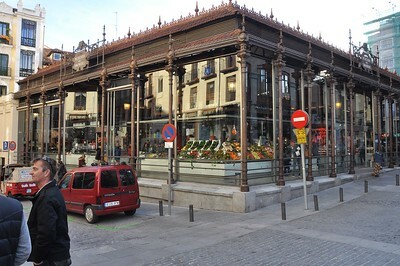 The Mercado de San Miguel served as an open air market prior to 2014. It is now an enclosed gourmet market where vendors sell tapas plates, hams, fish, fresh vegetables and cocktails. Hanging in the Mercado de San Miguel are various hams for sale. 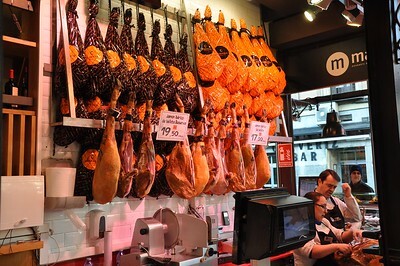 The ham for which Spain is best known is Iberian ham, cured from hogs fed only acorns. You can see the prices in the picture. Those are in Euros and for 100 grams, which is about 3.5 ounces. 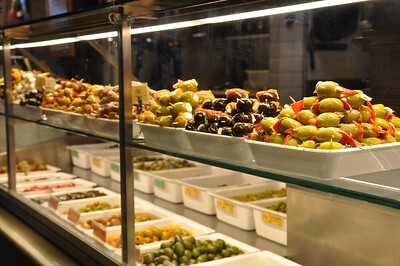 Olives of different varieties and prepared different ways for sale in the Mercado de San Miguel. Fresh fish! 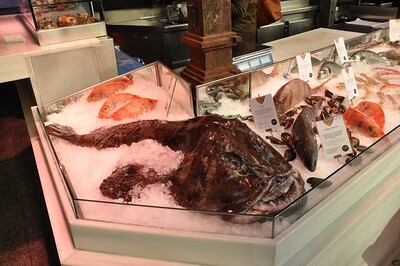 This monkfish is for sale in the Mercado de San Miguel. The price isn't visible, but with a face like that, not many people ask for the price. 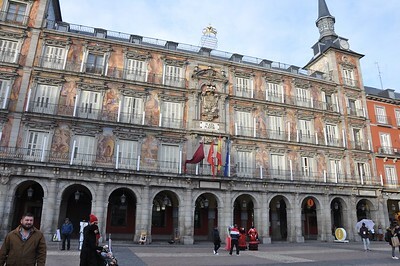 This is the only building in Plaza Mayor not damaged in a huge fire which spread to all of the other apartment buildings surrounding the square. The paintings on the building date back to the 1600s. 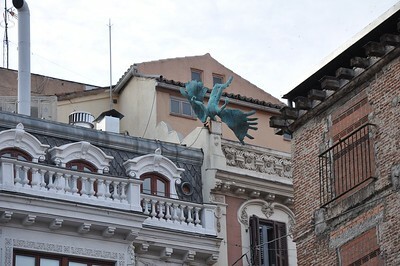 Statues adorn the tops of many buildings in Madrid. This one is of a fallen angel. The outside of the Hotel Agumar, the place Class XV called home for one night. 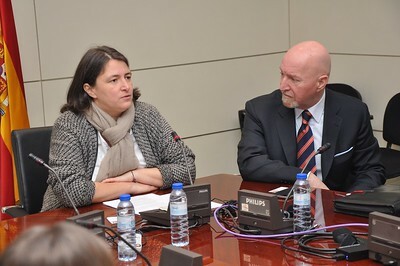 Two of the senior members of the IOC lectured the class on the politics of olives. The United States is in a rare position in relation to a food product when it comes to olives: it consumes far more than it produces and is one of the top importers in the world of olive oil. LSU Ag Leadership Class XIV starts their day at the International Olive Council in Madrid. The class learned about the intricacies of both olive production and bringing rival olive-producing states to the negotiating table.